Federal Polytechnic, Oko [OKOPOLY] National Diploma [ND] Full-Time Regular I and II Admission List of Candidates Offered Provisional Admission for 2018/2019 Academic Session. This is to inform all candidates who applied for admission into the Federal Polytechnic, Oko various National Diploma programmes that the admission list has been released for 2018/2019 academic session. 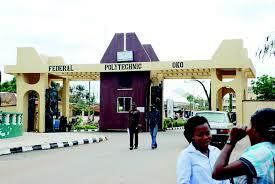 Federal Polytechnic Oko (OkoPoly) ND regular I and II admission list has been uploaded online. Kindly log on to the Oko Poly admission status checking portal via http://portal.federalpolyoko.edu.ng/modules/admissions/checkadmissionstatus.aspx. All newly admitted Students are to proceed with the payment of acceptance fee, school fees and proceed to the school for admission clearance. READ ALSO: Fed Poly Oko ND Clearance & Registration Guidelines 2018/19 [FRESHMEN].